The 2018 Atlanta Jewish Film Festival showcases a myriad of films, and this year, audiences were in luck if they saw The Invisibles. The Holocaust-era docu-drama blended fiction and reality, narrative and documentary into a lovely film. 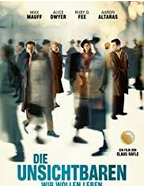 The film tells the story of a few of the 7,000 Jews living in Berlin, hiding in plain sight, in 1943, after the Nazi government declared it to be ‘Jew Free’. Of the 7,000, only 1,700 survived until the end of the war. The four Jewish teens’ lives that the filmmaker followed relied on the kindness of others and their own creative ingenuity keep their spirits high and their souls alive. The dramatization is beautifully shot and well acted, but nothing really to write home about. These specific stories may not be ones we’ve heard before, but the sentiment and timeline are nothing new. The interviews with the survivors are what you would expect. They recall living in fearful uncertainty, with the threat of consistently looming, but somehow keeping their spirits up and making the most of a horrible situation. The subjects are quite advanced in age at this point and at least one had died by the film’s release. The film is not bad by any means; it evokes emotion and is much better than watching a straight documentary about the subjects. It is a great film for teaching high school students about the Holocaust and what could have happened to people like them, if they had lived in that time. I give 3.5 of 5 stars.